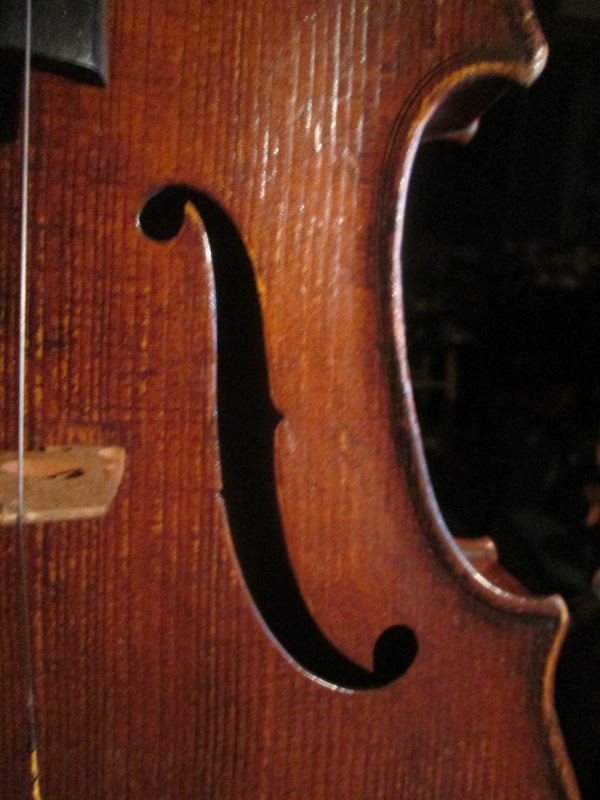 This fine viola was made by Helmuth Keller as a copy of Gaspar da Salo in the early 1970’s. 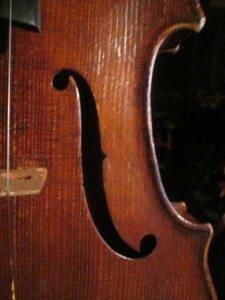 The Brescian makers are justly famous for their violas and this has all the characteristics one looks for in a great viola. 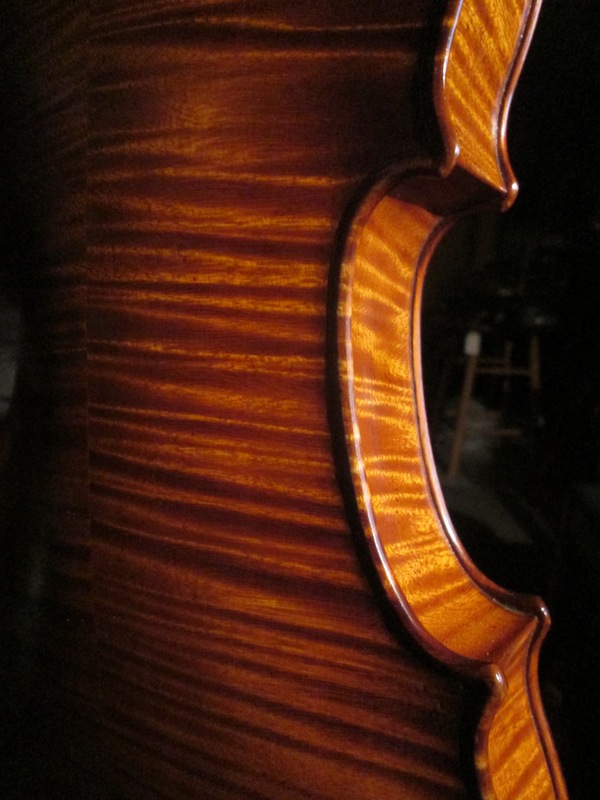 The broad pattern produces great depth while the flattish arching provides ample power and projection. 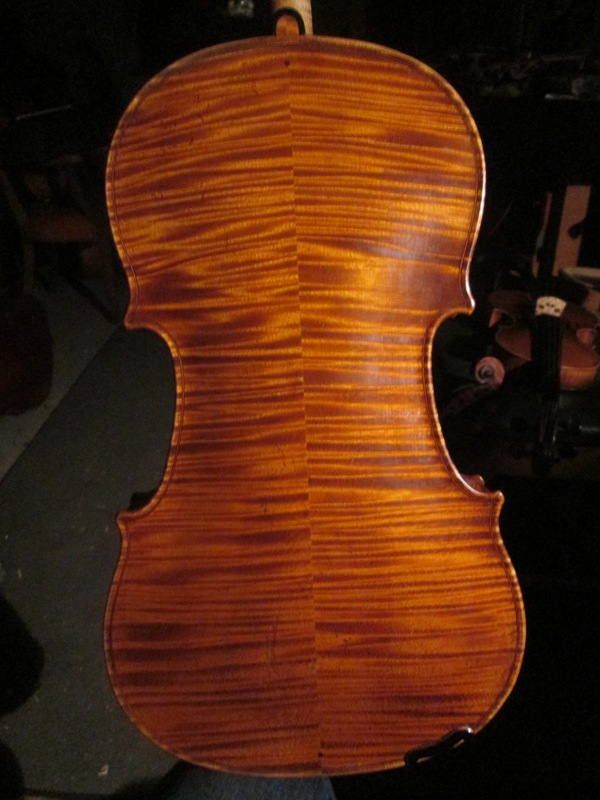 This viola shows Mr Keller working at his very best….with exquisite wood selection… commanding craftsmanship ….all still in pristine condition. Mr Keller came to America to work at Moennig’s and Bill spoke fondly of him over the years. I had the pleasure to speak with him a number of times and always enjoyed his energy and intensity. Interestingly, this viola ( like all his violas of this period.. I believe )is not dated…. I was always told it was because Mr Ormandy did not want his players playing new instruments ….and this was a cute,cunning way around that. I am proud to be offering this fine viola for sale. I have also used the fitting with spring experience on a smaller scale. 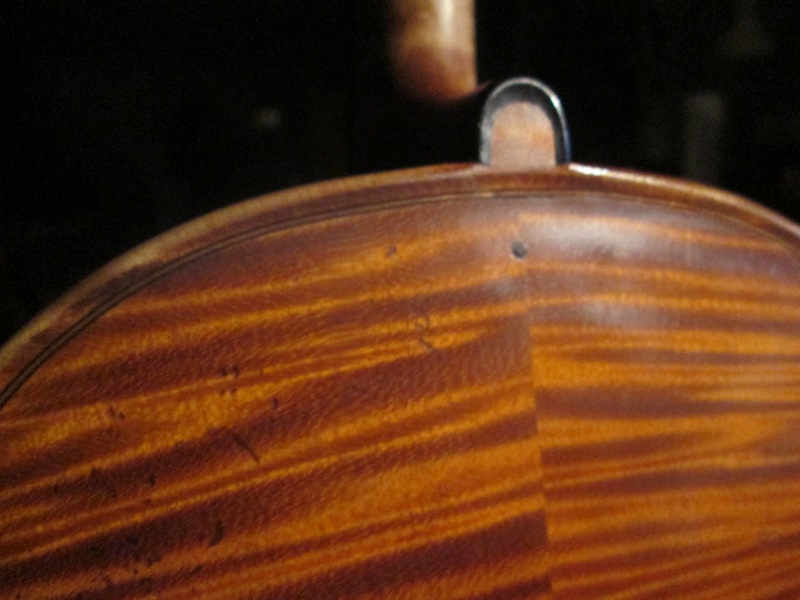 Cracks on old cellos (and sometimes new) have a tendency to sink ….typically due to the enormous string tension down on the thin,soft spruce top. 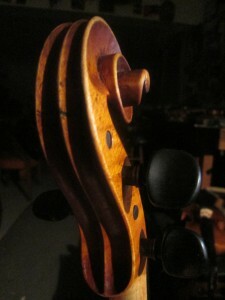 I often fit the spruce cleats like little bass bars pushing up to restore the arching at the area of the crack. It also works to counteract the tendency for the crack to sink over time. These cleats are fit with chalk as a transfer with a slight arch in the center -( the amount of spring varies with each different repair) and the two clamps together with the hot glue can add just the right amount of force to help me make the crack (eventually!) disappear. It is rare for me to not change a bass bar when doing a thorough restoration in preparing to off an instrument for sale. Often the size(or lack of),shape ,positioning is not ideal to drive the lower register as well as possible. Another reason that has grown on me over years of fitting countless bars is the added benefit of fitting the bar with “spring”. When fitting the bar you start with the center of the bar touching the top and the ends slightly up off the top. This is the beginning of the spring. As you fit the bar to the top you delicately rock the bar from one end to the other carefully feeling for all the bumps – i.e. the places where it is not fitting.As you complete the fitting and the bar and top are basically meld together as you rock back and forth. 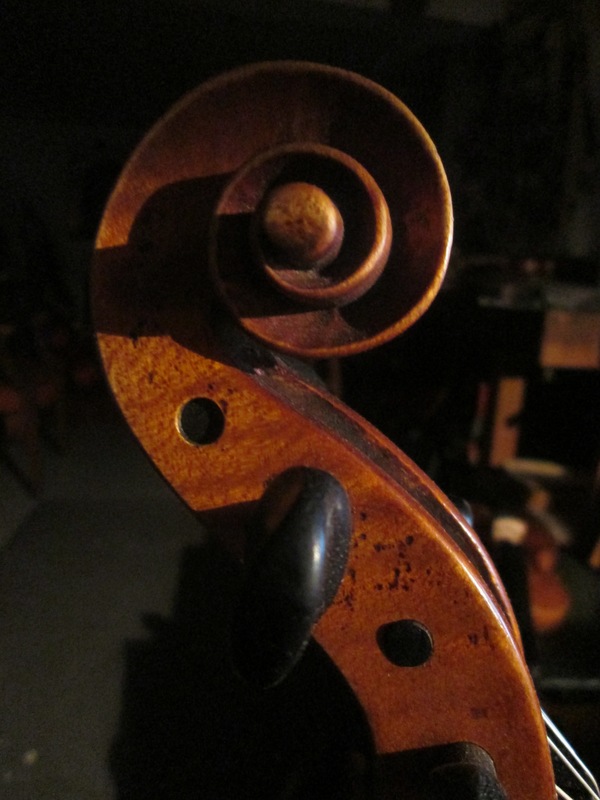 The bar will sit flat against the top in the unclamped state – the ends will still rise up off the top….this is the spring that will create the upward thrust pushing up against the downward force of the string tension….much the way the camber in a bow adds a counter force to the tension of the hair and the strenuous demands of playing. Certainly there are limits ….too much and you would distort the top…..also different archings need different amounts of spring. One thing of the highest importance is that the fit of the bar needs to exact to invisibly produce this force without warping the top. 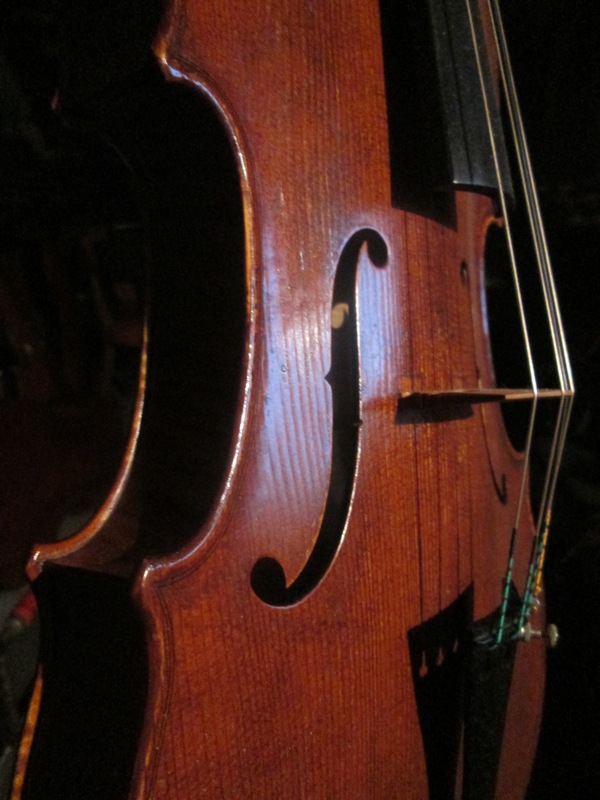 There is also debate as to whether bars lose their spring over time – much like older bows losing their camber – over the years my thoughts and experience have told me that yes they do lose their spring – and that instruments can benefit immensely from a new bar that precisely adds it. 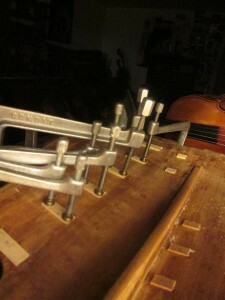 One thing that comes to mind in this photo is that I’m fitting the bar to the cello while it rests on my lap/knees with the edge of my bench in view. 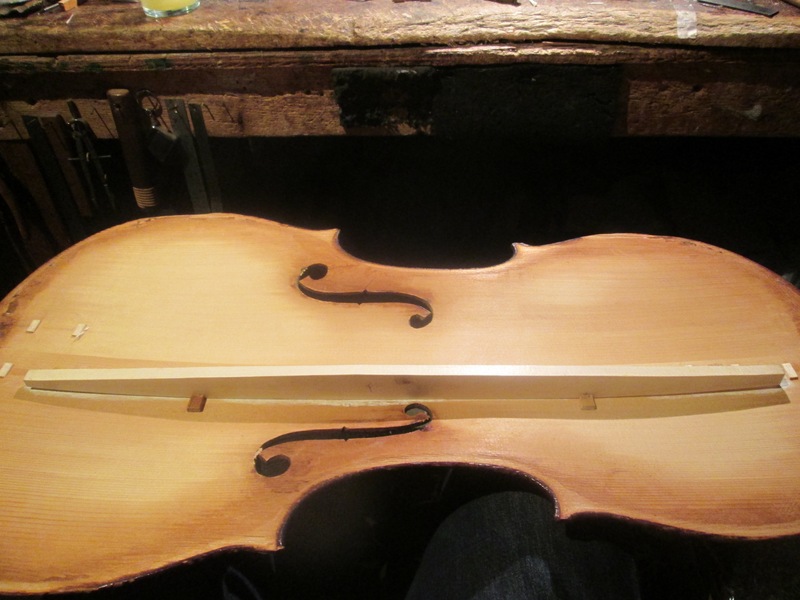 Mr Moennig never liked that way of working…..he would shake his head and say “Mike ….you use your bench as a shelf instead of a work place”. He had trained in Mittenwald and Mirecourt where you did your work on the bench top….never on your lap. 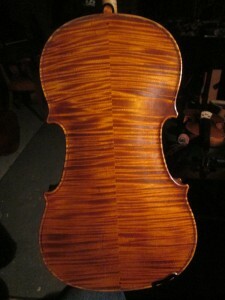 I had worked with Burritt Miller ( who studied in Cremona) and others at the shop. I like to be around the work and the more intuitive/tactile approach seemed to fit…..but Bill was never on board with that….but he reluctantly went along.